The dramatic design of the Sacramento River pedestrian and bicycle bridge befits Northern California's stunning scenery of volcanic mountains and lush forests. Santiago Calatrava, the renowned Spanish architect who designed the steel and glass structure, took his inspiration from the Sacramento River. He responded to the river's beauty and to the need to avoid disturbing the river's endangered Chinook salmon population. With no structures in the river, his resulting design seems to defy gravity. A steeply angled pylon on the riverbank supports the bridge with numerous steel cables. The pylon also acts as a giant sundial, glowing bright white in the noonday sun. The unique beauty of the bridge is nearly matched by its functionality; it safely conveys pedestrians across the river and connects a new natural sciences museum, an arboretum and a 32-mile network of riverside trails. 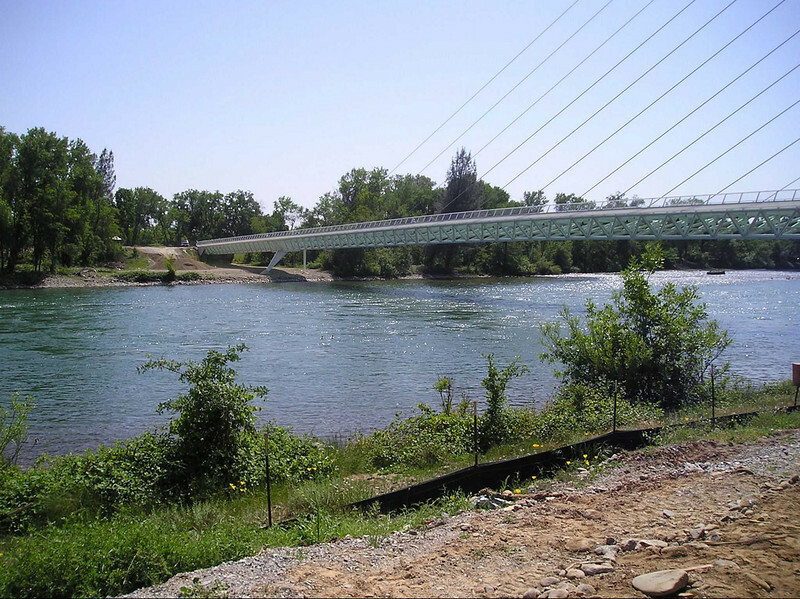 A TE award received by the city of Redding for $1,371,000, along with the local matching funds, defrayed some of the bridge's $23.5 million total construction cost. The remaining costs were covered by the private McConnell Foundation.